Summertime, and I'm enjoying BBQing weather. 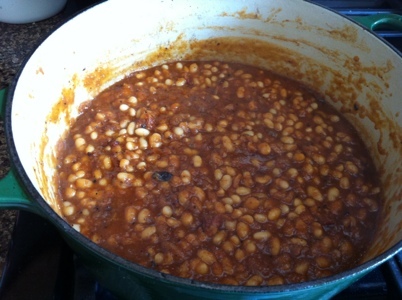 We got to host two families of friends for 4th of July, so I wanted to try my hand at SCD baked beans. This sounds easier than it is, since it's hard to get a rich flavored BBQ sauce without molasses. But then I had an idea: Carmelize onions. Soak white beans for 24 hours or more; I often change the water a few times in that time, then rinse, add new water and simmer until tender. 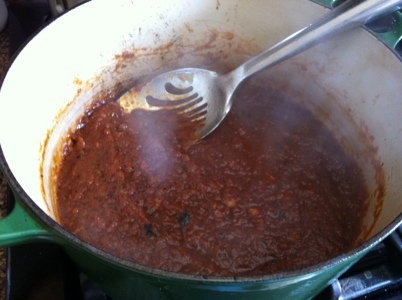 In a separate pot begin the sauce: use your heaviest large pot, enameled if you have one. Basically, you are going to Carmelize 3 yellow onions in butter like making French Onion soup. Halve and slice the onions in 1/2 inch slices. Heat pot to med high and melt 1/2 stck butter. 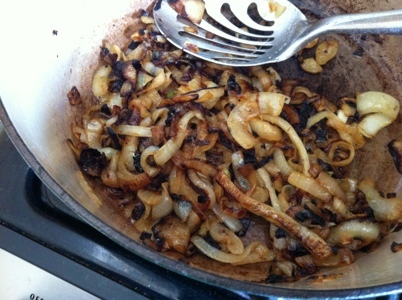 Toss the onions in the butter and allow them to brown, lid off, 45-60 min, stirring at least every 10 minutes. Don’t let them burn, but a little char is ok. You may need to go down to med heat after 30 min. When they are all shrunken and brown, transfer them to food processor and blend smooth. In the same pot (don’t rinse), fry until crisp 8oz SCD bacon, then add back the onion purée. Then add one 14 oz can diced tomatoes with juice to processor and blend smooth, add to pot. Add about 5? Cups of the cooked white beans to pot, about 1cup mesquite honey (it’s a little smokey), about a Tbs Dijon mustard, about 2 Tbs applecider vinegar, some salt…just keep stirring and tasting, and adding. Put the lid on the pot and stick it in a 300 degree oven for about 4 hours, scrapping down the sides each hour. 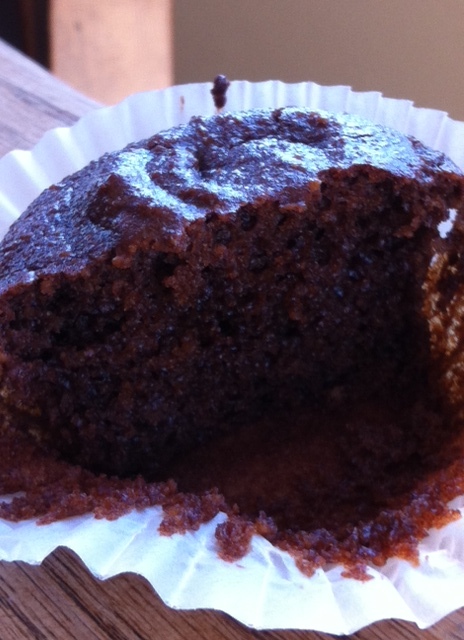 It will become darker and richer tasting…keep adding honey/Dijon/salt/vinegar as needed. 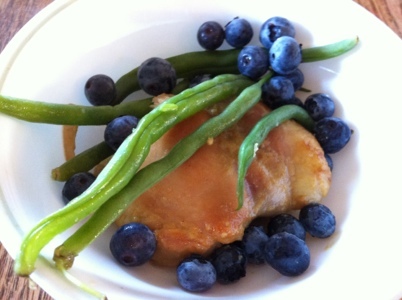 We also enjoyed Honey Mustard Chicken, which is super easy. My inspiration was the Man Pleasing Chicken at Witty In The City. 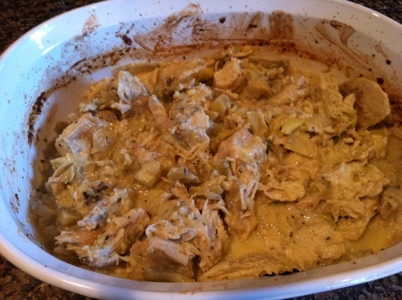 Fill a 9×13 glass pan with skinless chicken thighs (if frozen, thaw and drain off liquid), about 2 lbs. Spread all over the chicken and let sit in the refrigerator at least 1 hour. Bake in a 450 oven for 40 minutes, or BBQ until thermometer reads 165. Sprinkle chopped fresh Rosemary on top for a great flavor sensation. This is optional; my husband prefers it without. Yum!! In this picture, I chopped it up to serve it to kids. 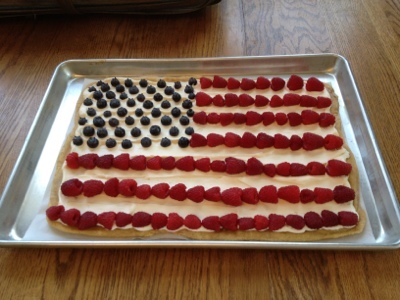 In the following picture, I served it whole with blueberries and green beans from the garden. 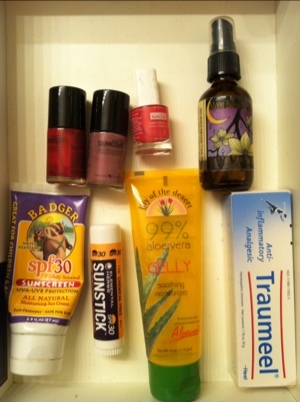 I just threw some summer products in a drawer, then thought to take a picture and tell you what I’ve been loving (and not loving). If you see these on end-of-season clearance, stow them away for next summer. Suncoat nail polish in Poppy Red (a great retro orangey red with a hint of metallic…love with aqua jewelry) and Purple Haze. Use two coats, and the color is brilliant. Water based. Suncoat Girl polish (pealable) in Forever Fuscia. Fun for my daughter, and water based so less chemicals to inhale during application. Moon Blossom No Bugs On Me essential oils blend in olive oil. Got this at a farmers market a few year ago, so you may not be able to find this one, but it had oils of lavender, geranium, cedarwood, eucalyptus, citronella, and cinnamon. Seems to work well, when we remember. I have most of these oils, so when I run out I plan to buy the last one and mix up my own in olive oil. Traumeel by Heel. Heals up bruises (knees, shins, foreheads) in a hurry! The sooner I get it on the owie, the sooner the discoloration stops developing. This stuff is amazing! One child got her three fingers caught in the car door hinge (ouch!!!) 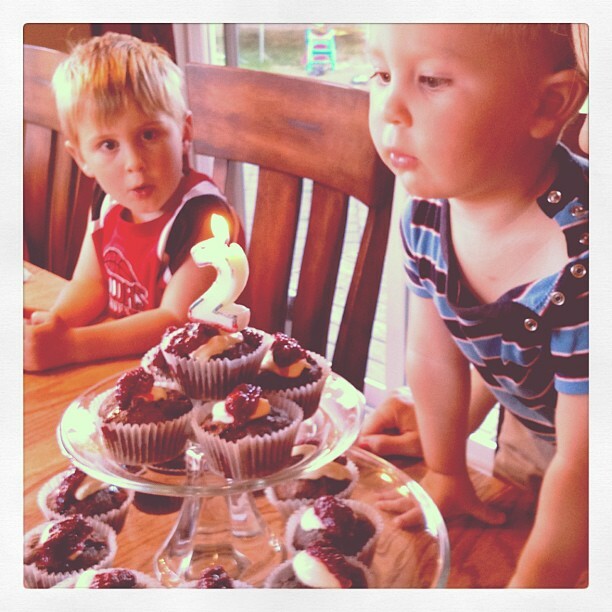 but we iced them immediately and put this on. Even though she eventually lost one nail, there was no bruising. Weird but true. Aloe for sunburns…my husband forgets to cover up sometimes, so we keep this handy for the inevitable burn. Sunstick by Elemental Herbs. A face stick of zinc sunscreen. Great way to apply it to the most important spot…and really works at 30spf. It didn’t expire or wash off for us. Great price for this quality product. To see why I only use mineral sunscreens, read this post. Badger Zinc Sunscreen. We also used the Badger Infant Sunscreen and enjoyed it. These formulas are thicker and greasier than what we are used to. You have to keep rubbing them in for a bit, but then they become transparent, stay on, and don’t require re-application. Once you get used to more intensive application, it’s great, great stuff. Pleasant smell, doesn’t burn the skin (or wash off into eyes). Love it! 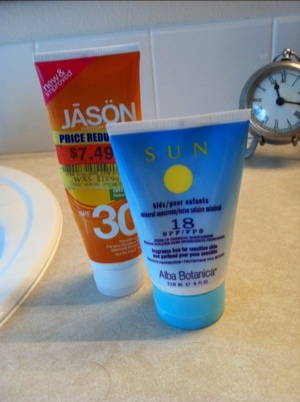 I’ve also tried these two brands of mineral sunscreen: Jason and Alba. I don’t like them as well. You can see I got one on clearance last year. They are both thinner/more like regular sunscreen in consistency, but I’ve had problems with them separating; not sure if it was age or heat related. Also, both have titanium dioxide, not just zinc, and there is some question about the safety of this internally. Zinc is something we need more of on the inside, so I’d rather be rubbing that on the outside too. 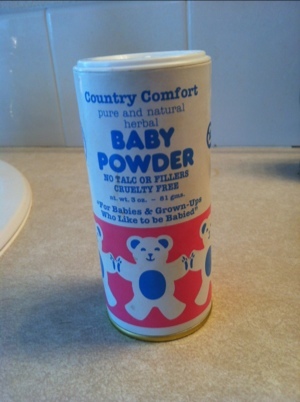 Next year, I’m going to pack my baby powder along to the beach; saw on FaceBook that you can use it to clean sand off skin.